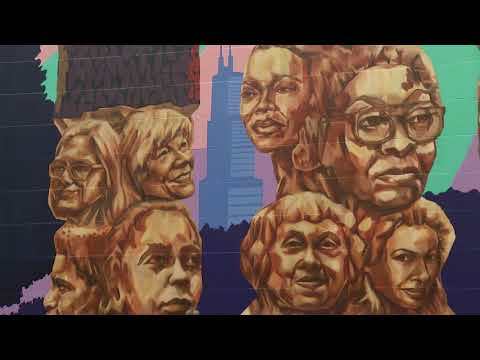 Renowned artists and MacArthur Fellow Kerry James Marshall will create an epic, large-scale mural for the Chicago Cultural Center (78 E. Washington St.), honoring 20 women who have shaped the city's vibrant arts and culture landscape. The 132-foot by 100-foot mural will be the largest artwork he has ever designed or created. Work will continue throughout October to coincide with the month-long Public Art Festival. The mural is funded by Murals of Acceptance, whose goal is to bring art to all people in a free public setting. It will be installed on the building’s Garland Court façade, between Washington and Randolph Streets. The design and vision created by Marshall will be executed by Chicago mural artist Jeff Zimmermann and his team from Jazim, Inc.
Kerry James Marshall is an artist and MacArthur Fellow. A deeply accomplished artist, Marshall uses many types of mediums, including collage, drawings, murals and even comic books. His work is known for referencing African American culture and history, including the Civil Rights era and the Black Power movement. Painting in a Realist style, he depicts dark figures that celebrate black beauty and confront general racial stereotypes within contemporary American society. He has received solo exhibitions throughout Europe and North America and his work has been included in such prestigious international exhibitions as the 1997 Whitney Biennial, the 2003 Venice Biennial, the 2009 Gwangju Biennial, two Documentas (1997 and 2007) and the 1999 Carnegie International. Debuting at the Museum of Contemporary Art in Chicago in April 2016, Marshall’s retrospective Mastry spanned his 35-year career and included nearly 80 original pieces. On August 28, 2017, the City of Chicago presented Kerry James Marshall with the Fifth Star Honor Award for his many contributions to our city’s cultural landscape. Garland Court, 78 E. Washington St.